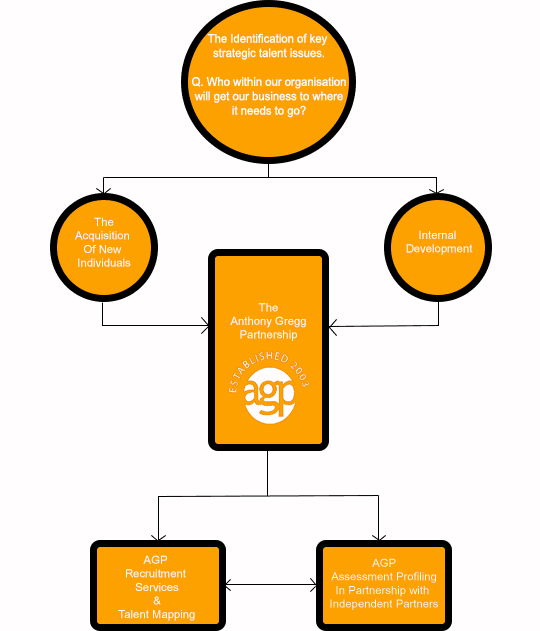 The Anthony Gregg Partnership has a long standing reputation within the retail industry for providing a comprehensive Talent Mapping service. Talent mapping, simply put, is the identification of where top talent is. We conduct competitor analysis and map the organisational structure, in order to identify targets. You will have an insight of individuals in a company according to their job title and skills. We can provide full names of employees, their job title, their specialist sectors and key skills. Simply put, no. Talent Mapping can be done quite successfully within your own organisation and we can help you execute this perfectly. What we do is first take you through your own business on a journey of learning and discovery with a distinct strategy in-place. If we cannot find what is within then we look externally at all competitors; this approach is sometimes described as Market Mapping. Provides a current perspective on talent in your market in line with planned business growth or recruitment needs. It benchmarks compensation and benefits packages. You will always have key individuals at hand so you can act decisively and quickly when a need arises. What we do is successfully identify talent from within your organisation and help you nurture it to achieve excellence. Our service is always independent and completely absent of bias. By providing you with performance evidence we are able to appropriately align each candidate with the exact requirements of the role and the business. We can remove many of the common roadblocks that businesses face when attempting to identify talent. We ensure that removing subjectivity is vitally important. We ensure that the entire process remains objective, so you really do think carefully about what you are really looking for. Above all else, we ensure that your organisation has focus. Without a clear focus about where you want to be you cannot plan ahead. We prevent any disconnect with the business plan and then help you find the best candidate for the role and the company. Please do not hesitate to call Tony Gregg on +44 (0)203 178 4944 or alternatively contact via email Tony@anthonygregg.com for more information. We will find you the most appropriate consultant to assist you with your talent requirements or indeed help with the development of the talent you already hold. The Anthony Gregg Partnership is a specialist Retail Executive Search and Interim provider. Incorporating psychometric assessments and talent mapping; Helping our clients maximise the opportunity for growth.